Ojets plans to grow its current fleet of three Bombardier business jets to nine, which will complement the 21 from its recent acquisition of Elit’Avia. Pictured is its latest Global 6000 at ABACE. OJets formally introduced its new charter program during ABACE yesterday, outlining plans to offer long-range service from the Asia-Pacific market initially with a fleet of Bombardier aircraft, as well as a range of management and business aviation services through its newly acquired Elit’Avia charter and management company. 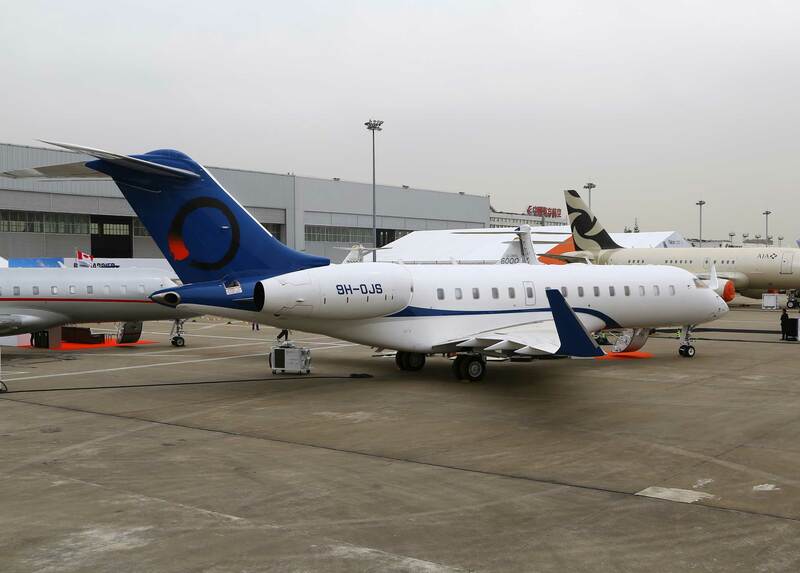 OJets kicked off operations this month with a Global 6000 and Challenger 650, financed through Minsheng Financial Leasing, and since has added another Global 6000 from the U.S. The aircraft has already flown in revenue operations and is on display during ABACE (Static Display 14). The three are part of an ambitious plan to grow the fleet to as many as nine aircraft within the next three to four months. “This growth is underpinned by $350 million in equity and debt and will establish OJets as a global operator with one of the newest fleets of long-range business aircraft in service,” OJets CFO Michael Ta said. While the initial aircraft are financed through Minsheng, OJets is working with multiple financial institutions as it grows the fleet, said OJets CEO Nicholas Houseman. The aircraft will all be young, under two years old, and primarily Globals, Houseman said. The operation is promising a “bespoke experience” through two primary models: traditional on-demand charter and a block-hour program. The on-demand program, designed for the occasional traveler, is pay-as-you go, available for one-way trips, and offers a choice of aircraft. The block-hour program is designed for frequent travelers and comes with personalized service, 48-hour guaranteed aircraft availability at a fixed hourly rate, global coverage, and no ferry fees within a service area. The block-hour program will not require an initiation fee, nor will it involve monthly management fees, OJets said. OJets is equipping the aircraft with a range of amenities such as Wi-Fi, dedicated workspaces, and sleeping configurations. The operation further is planning “white glove service” by multilingual, international flight attendant teams. OJets already has sold its first block-hour contracts, which has been the initial focus of the company as it looks to build its customer base. Houseman said the operation already is attracting significant demand, and from China in particular. That demand has been split among individuals and corporation. Headquartered in Ljubljana, Slovenia, Elit’Avia gives OJets an anchor in the European aircraft management, charter, and aviation services market. With the acquisition, the number of owned and managed aircraft jumps to two dozen, including the 21 in the Elit’Avia fleet. The acquisition further brings to OJets “a decade-long wealth of operational experience and an unmatched reputation for professionalism,” the company said. Houseman brings a background in emerging companies, as well as OEMs. He has had a stake in Elit’Avia since 2011, founded Zenith Jet in 2008, and previously served with Bombardier. Elit’Avia chairman Michel Coulomb and CEO Puja Mahajan, meanwhile, will continue to manage the day-to-day operations and service the clients of Elit’Avia as a wholly-owned subsidiary of OJets. Elit’Avia will maintain a separate brand. OJets will give Elit’Avia further access to the Asia-Pacific market, Houseman said, providing an ability to expand its aircraft management services there. “It allows us to expand into a region that is challenging,” Houseman said, adding this will pave the way for global growth. It also will enable both the Elit’Avia and OJet operations to leverage each other’s fleets when needed. OJets operations will be managed under Elit’Avia’s Maltese AOC. Houseman highlighted the benefits of the use of that AOC, including that it provides global access, including Part 129 approval for flights to the U.S., IS-BAO registration, and ETOPs approval. Elit’Avia has three AOCs, also including Slovenia and San Marino. Long-term, Houseman sees OJets operations expanding to the U.S.